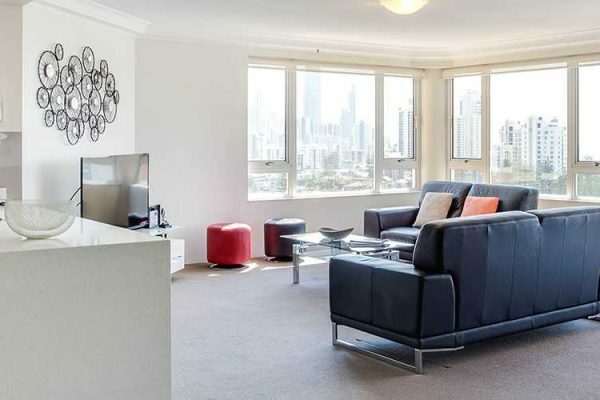 Our fully-renovated and self-contained 1 Bedroom Premier apartments are the perfect place to relax during your Gold Coast visit. These rooms include a full kitchen and laundry facilities, a Queen bed, air conditioning and modern decor, furnishings and fittings throughout. Stunning views of the Gold Coast area and surrounding hinterlands can be seen from the private balcony (views are different in each room). State-of-the-art guest facilities including our heated outdoor swimming pool, spa, sauna, tennis courts and BBQ facilities are located just seconds from your room and are available for exclusive guest use. Belle Maison is located just a few minutes walk from Broadbeach, which offers shopping, dining and nightlife, while a further 10 minutes away you have both Jupiters Casino and the newly refurbished Pacific Fair Shopping Centre with hundreds of specialty shops and a wide selection of dining options. The building is safe and secure with full security control on entry doors, lifts and the undercover car parking area. There is a maximum of 2 guests for this apartment type.